LOGO ON A KEYRING OR BADGE! Hello, and welcome to the Badge-a-tron website! I would like to thank all customers who have ordered over the last few years. It has been fascinating to learn about all the different projects and events people are involved in, and great fun to design the badges and keyrings to help promote them. We still specialise in classic 25mm pin badges and basic promotional keyrings and now have some great new products to add to the range. These include larger sized badges, t-shirt shaped keyrings, heart shaped keyrings and pocket mirrors! Click on the 'Latest Products' button for more info. Pin Badges are 25mm quality metal pin badges. They are suitable for a small copy of your logo or image with text and can be designed to your own specifications. 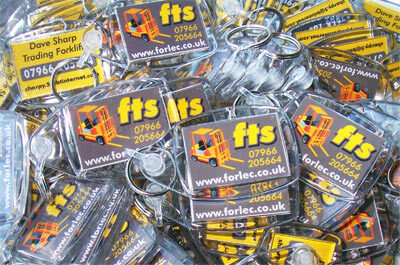 Promotional Keyrings are made from clear sturdy acrylic. They are 75mm long including the ring and 35mm wide. The aperture size is 35mm x 24mm. They are double sided for a full colour print on the front and reverse. They can be printed to order with your own logo, text and image. Suitable for promotional business use or as a personalised gift! Click on the 'Buy Now' pages for a list of quantities and prices. All design work professionally taken care of at no extra charge. Simply email with your requirements.